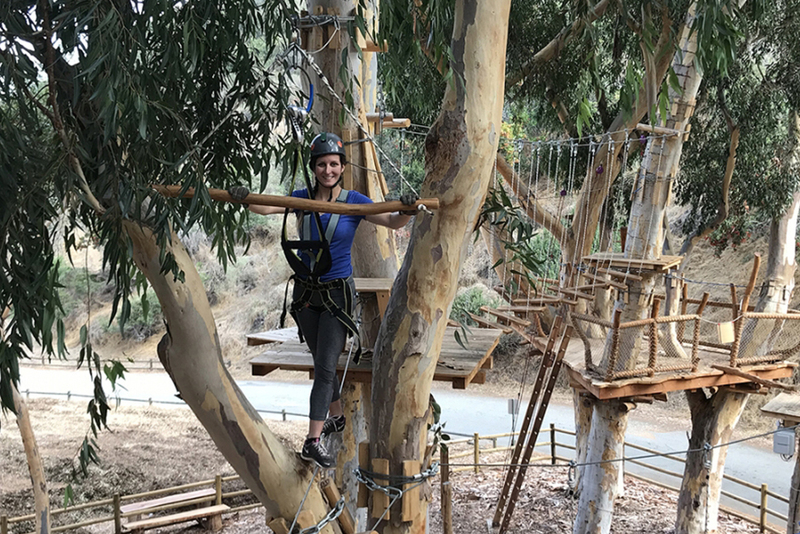 When the Aerial Adventure on Catalina Island opened, we didn’t have to think twice about trying it out. After tackling the climbing wall and undertaking the Action Flyboarding, we have been waiting for a new adventure on the Island. The convincing argument for this one: they have three levels of difficulty: beginner, intermediate and advanced. So there are no excuses for not trying at least the beginner level. My friend and I ventured to the Island to see for ourselves what this is about. Since we’re very adventurous, we decided to start with the intermediate route and end on the advanced one. After we put on our gear and met the instructors, we went over to the small introduction route that is built close to the ground to help you get used to the gear and how to clip in. We both felt pretty confident and ready for the real deal. Up the first rope, I could already tell this was going to be fun. The whole course felt challenging yet easy enough to enjoy swinging around in the trees and probably looking ridiculous. My favorite part was the zip line to get from one obstacle to the next. Easy, fun and the only thing you have to do is step off the platform. After monkeying around on one of the intermediate routes, we attempted the advanced one and let me tell you, it’s not as “easy” as it looked. All routes are self-paced and self-guided, but there is always someone around to ask for tips or help with the next step. Luckily our instructor saw that we were having some difficulties and stuck around to give us some much-needed advice. After about 1.5 hours, we finished both courses and were ready for a drink. If you feel like us after trying this, head down to Descanso Beach Club, it’s only a few minutes away and has a great Buffalo Milk. I hope to go back soon and try the advanced course again. And while I’m there, I hope to see you climbing around on the course next to me. Have fun!